Know: List some of your rights as a citizen of the United States of America. Tell ways you can show respect for the rights of others. Commit: Name some ways a boy your age can be a good citizen. Tell how you plan to be a good citizen and how you plan to influence others to be good citizens. Practice: Choose one of the requirements for this activity badge that helps you be a good citizen. Complete the requirement and tell why completing it helped you be a good citizen. Know the names of the President and Vice-President of the United States, elected Governor of your state and the head of your local government. 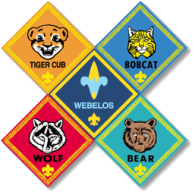 As a Webelos Scout, earn the Cub Scout Academics belt loop for Citizenship (if not already earned) or earn the pin. At a Webelos den meeting, talk about the service project Good Turn that you did. Play the Body Language Game with your den. Prepare and give a three-minute talk to your den on a subject of your choice. Invent a sign language or a picture writing language and use it to tell someone a story. Identify and discuss with your den as many different methods of communication as you can (at least six different methods). Invent your own den secret code and send one of your den members a secret message. With your den or your family, visit a library and talk to a librarian. Learn how books are catalogued to make them easy to find. Sign up for a library card , if you don't already have one. Visit the newsroom of a newspaper or a radio or television station and find out how they receive information. Write an article about a den activity for your pack newsletter or web site, your local newspaper, or your school newsletter, newspaper, or Web site. Invite a person with a visual, speaking, or hearing impairment to visit your den. Ask about the special ways he or she communicates. Discover how well you can communicate with him or her. With your parent or guardian, or your Webelos den leader, invite a person who speaks another language (such as Spanish, French, Arabic, Hebrew, etc.) as well as English to visit your den. Ask questions about the other language (its background, where it is spoken, etc. ), discuss words in that language that den members are already familiar with, or ask about ways to learn another language. Use a personal computer to write a letter to a friend or relative. Create your letter, check it for grammar and spelling, and save it to a disk. Print it. search the Internet and connect to five Web sites that interest you. Under the supervision of a parent or other trusted adult, exchange e-mail with a friend or relative. While you are a Webelos Scout, earn the Academics belt loop for Computers. While you are a Webelos Scout, earn the Academics belt loop for Communicating. Find out about jobs in communications. Tell your den what you learn. Tell what is meant by family, duty to family, and family meetings. Make a chart showing the jobs you and other family members have at home. Talk with your family about other jobs you can do for the next two months. Make a list of some things for which your family spends money. Tell how you can help your family save money. Plan your own budget for 30 days. Keep track of your daily expenses for seven days. Take part in at least four family meetings and help make decisions. The meetings might involve plans for family activities, or they might be about serious topics that your parent wants you to know about. With the help of an adult inspect your home and surroundings. Make a list of hazards or lack of security that you find. Correct one problem that you found and tell what you did. With the help of an adult prepare a family energy-saving plan. Explain what you did to carry it out. Tell what your family does for fun. Make a list of fun things your family might do for little or no cost. Plan a family fun night. Learn how to clean your home properly. With adult supervision, help do it for one month. Show that you know how to take care of your clothes. With adult supervision, help at least twice with the family laundry. With adult supervision, help plan the meals for your family for one week. Help buy the food and help prepare three meals for your family. While you are a Webelos Scout, earn the Academics belt loop for Heritages. Explain why garbage and trash must be disposed of properly. Explain how you can get help quickly if there is an emergency in your home. Make a "help list" of people or agencies that can help you if you need it. Post it near a phone or another place with easy access. Explain how to use each item in a first aid kit.